Observe warmly dressed friends drill holes through two feet of ice on a lake in northern Wisconsin. Bait a hook on a jig pole with a waxie and lower it into said hole to attract a white fish known locally as a bluegill. Set the hook with a sharp tug when a bluegill begins to swallow the bait (which I know because the little red-and-white plastic bobber floating atop the water stands suddenly at attention, then begins to sink). Remove hooks from three bluegill mouths (replete with hard lips and reproachful yellow eyes) and keep the one that was legal to eat. And then came the real mind-boggler: watching our friend Leah pull an 8-pound, 34-inch northern pike through her ice hole, yelling things the FCC suggests we ought not. 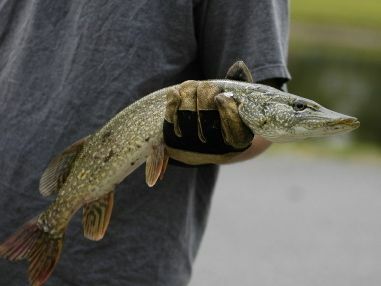 [%image reference-image float=right width=350 caption="A northern pike, although not Leah's pike."] I was eating a bratwurst and, too lazy to jog over to the hole, I stayed by the fire. But judging from all the jumping around and yelling and picture-taking, I would say this fish was a lulu. Aside from a disgusting adolescent experience that involved decapitating an anonymous French fish, I enjoy fishing. I like walking along the streams and to the holes; I like watching a line settle on the surface of the water. I like the movement of fish, both on and off the line. Many years ago, I spent an hour watching trout leap for a lure I held above a dark bend in a stream. I know I was teasing those fish. But as with so many pursuits, our play is the foundation of our seriousness. To me, eating is serious and, though it would be hard work for me to eat entirely from what I catch, that lure-dangling helped me develop fishing skills. This is not to suggest that I am good at fishing. I am a passable fisher; in the summer of 1999, I was almost good. Fishing takes lots of practice and, as many famous chroniclers of the pastime have observed, a healthy appetite for disappointment. Another thing I never expected to do was watch someone field-fillet a northern pike. This was Leah again, a woman who is nothing if not surprising — and a dedicated and agile fisher. Once she had overcome her shock at the size, muscularity, and vigor of the pike, she explained that she disliked filleting fish that had been frozen. Too mushy and nasty for her. Since it was about 30 degrees out, Leah reconciled herself to the fact that she would have to do some fancy cutting on the lake. Accordingly, she popped on her cross-country skis and made the three-quarter-mile trek back to the car. Then she glided back placidly with her fillet knives tucked in her waistband. Settling upon a flattish log with an armful of newspaper, she began dismantling the pike, cutting behind the gills and along the spine following a diagram her father had given her when she was in grade school and asking me to re-read relevant passages when her hands became too covered in slime and blood to handle the creased, photocopied paper. Soon we learned that this fish was female: two dark orange egg sacs the size of sunglasses cases came spilling from her belly region. Probing the fish’s stomach, Leah found a quarter-inch minnow. The pause was brief. Very soon she was working the knife along the spine, and fillets emerged, pale and square. I held the newspaper steady as she worked the knife between the skin and meat, cursing a little each time she missed a speck of flesh. As the work grew less stressful and her hands became surer, we talked of the pike’s reputation for boniness and of the jaw-dropping volume of meat the fish would produce. The next night, we ate the pike with biscuits and salad, each diner imitating Leah’s colorful display when she first reeled it in. The last of this fish sits pickling in my own refrigerator as I write this post. People nowadays use words like terroir to describe knowing the landscape through the food it produces. I have no doubt that what I have described above is an enviable (and hard to reproduce) example of terroir in action. But more than that, what I have done is told a story. I believe we could all find one meal a week about which to tell a story — a fish story, even. And if we did, we would be enlightened or amused or frightened or gripped by that thing that we do about five times a day: eat.